Dr Jengo's World: Watch Dogs 2 announced! Watch Dogs 2 has finally been announced and revealed officially! With no Assassin's Creed game this year, Watch Dogs 2 was highly anticipated to receive a sequel and with E3 2016 just a couple of days away, it was a matter of when rather than if. Here it is, the official trailer reveal.. I haven't played the first but there looks like Watch Dogs 2 has plenty more fun gadgets and machines to play around with, while keeping the open world playground. Join DedSec? 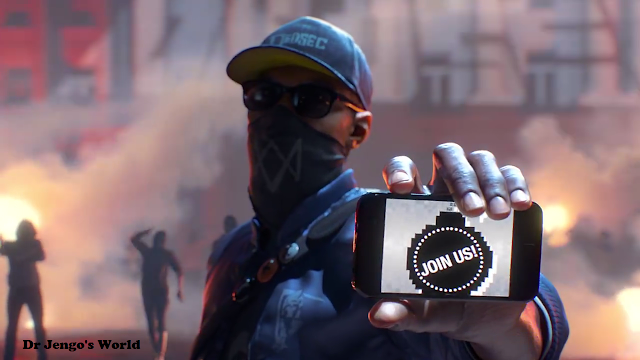 Haha, I like Ubisoft's marketing strategy where they get gamers to join these factions.. Join the Assassin Brotherhood, the Templars, We are Ghosts.. and now the DedSec faction. Good one though! Also, here's the World Premiere where the developers talk about the thought process in developing the game plus lots of details on what we can expect in the sequel. Definitely an interesting watch for players who like to know what goes on behind the scenes. I like the fact they put out a video like this together with the reveal trailer so that we can get the info straight up. 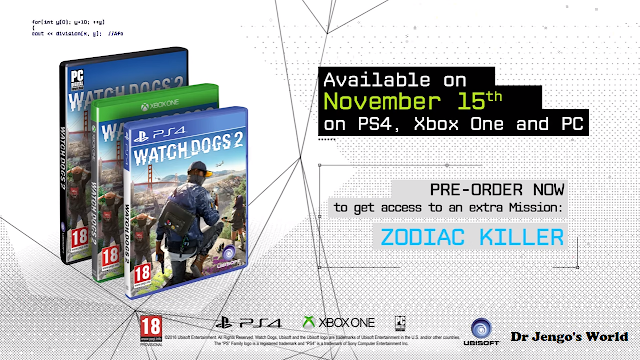 Love it or Hate it but there's several tiered Special Editions announced for Watch Dogs 2 but I can't find the pics as of now. Will update the blog again once I got the pics..
Nov 15 release date.. Are you ready? Who else is looking forward to this? Most people found the first game a bit too repetitive and boring but it was the same for the first Assassin's Creed game.. but I'm looking forward to see if they can fix the problems and make an overall better sequel.